In Egypt, Sir Basil Dawson and Richard Dawson and his assistant, Seth, who bears a striking resemblance to Sir Basil, break into an ancient tomb. Seth, in a fit of jealousy, attacks Sir Basil from behind and seals him in the tomb, noting his intention to return to England and assume his identity. As the tomb is sealed, Sir Basil shouts that Seth will never get away with it, yelling, "One thing that will hang you is my wife! My wife will hang you!" Charlie Chan and son Barry are visiting the British Museum, awaiting the arrival of Sir Basil Dawson. Upon meeting Sir Basil, Chan finds that he has contacted the detective in the hope of finding his wife. Sir Basil tells Chan that his wife left him for another man twelve years earlier and that he has called on Chan to find out if she dead or, if not, locating her whereabouts so that he can obtain a divorce. As Chan refuses payment for his work, Sir Basil, noting Inspector Duff's mention of the detective’s desire to obtain an antiquity for the Hunter University Museum in the United States, offers Chan an original papyrus of what he describes as "Amon-Re's Book of the Dead" in exchange for his assistance. At Chan's hotel room at The Dorchester, Inspector offers a Missing Persons Bureau file on Lady Monica Dawson. Chan questions Duff on his knowledge of Sir Basil, and learns that he came into a fortune in recent years. To help his father locate the missing Lady Dawson, Barry places a notice in a London newspaper, noting that "news to her advantage" is involved. Chan visits Mrs. Shaw, Lady Dawson's mother who tersely informs him that she has no daughter. She has disowned her daughter due to her infidelities to her husband, Sir Basil. Convinced by Chan to help him in his search, Mrs. Shaw provides him with a photograph. However, as the detective shows her a letter possibly written by her daughter, Mr. Shaw surprises Chan, informing him that she has been blind since her daughter’s disappearance twelve years earlier. At Wellington School for Boys, Chan questions the Headmaster about Sir Basil's youth. He learns of Richard Dawson an unsavory cousin to Sir Basil who is the opposite of all that Sir Basil stands for. Chan then learns that if anything were to happen to Sir Basil, Richard would inherit the family title and fortune. At Hyde Park Corner, Chan sees Richard in front of a few listeners rail against the upper class. At Mrs. Shaw's home, a woman with Mrs. Shaw named Enid has seen Barry's ad in the newspaper. She slips away and calls Barry, claiming to be Lady Dawson. Barry quickly calls Sir Basil to inform him that he has located his missing wife. Charlie Chan has gone with Richard Dawson to his flat. Asked if he has any knowledge as to the whereabouts of Lady Dawson, Richard states that he has not heard from her since walking out on his cousin years ago. It seems that Sir Basil and Monica had led the other to believe that they were wealthy. Sir Basil inherited his fortune following Lady Dawson's disappearance. Showing the note supposedly written by Lady Monica, Richard notes that it is not her handwriting, and that Basil probably wrote it. Shown a recent photograph of Sir Basil, Richard, at first glance, verifies that it is his cousin. However, on closer inspection, he realizes a slight difference in the ears from those of his Sir Basil, telling Chan that the photo is of an imposter. Chan suggests that the imposter has probably done away with Sir Basil in order to take his place. Calling him Sir Richard, Chan informs Sir Basil’s cousin that, as his cousin is deceased, like it or not, he is now a part of British royalty. At his hotel room, Barry meets with the woman claiming to be Lady Dawson. After offering proof as to her identity, Barry informs her that she will have to await the arrival if his "principal" before the matter can be concluded. A knock at the door reveals "Sir Basil" who is greeted coolly by Lady Dawson. 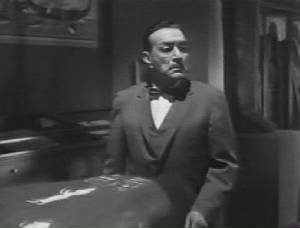 At the museum, Chan opens a sarcophagus, finding, that the mummy inside is actually the preserved body of a murder victim. Hurriedly telephoning Inspector Duff, Chan informs him that he has made an important discovery. Next, calling Barry at their hotel, Chan is informed by his number one son that he has successfully reunited Sir Basil and Lady Dawson and that they likely went on a second honeymoon. "I have great fear honeymoon will end in murder," replies an upset Chan. At a restaurant, "Sir Basil" speaks with Lady Dawson who sees through his charade. "Lady Dawson" informs him that she is not Monica and that she responded to the advertisement for the same reason that he is involved in his ruse: money. Enid tells "Sir Basil" that, as she has cared for Lady Dawson’s mother for the past ten years, she has learned a lot about Sir Basil's estranged wife. Reassuring him that she is working alone, looking forward to her settlement, "Basil" takes her to the British Museum. Entering Sir Basil's office, the couple are surprised to see Chan and Barry waiting. Showing "Basil" the old photograph of the young Basil Dawson, Chan reveals notes how the ears do not match, proving that he is an imposter and that Sir Basil is dead. Holding Chan at gunpoint, the false Sir Basil takes out a cigarette lighter and burns the photo, destroying the only piece of incriminating evidence and leaving only Chan's word against his that he is not really Sir Basil. Inspector Duff and the police enter the office. As Chan notes that he cannot disprove that the identity of "Sir Basil," Duff then arrests "Sir Basil" for the murder of his wife Lady Monica Dawson, the victim that Chan had found in the sarcophagus earlier! Meeting with Richard, who offers Chan the ancient manuscript as a token of his appreciation, he asks Chan what led him to suspect "Sir Basil." Chan explains that the imposter had incorrectly referred to the papyrus as the prayer of Amon-Re when, actually, Osiris is the Egyptian god of the underworld. As Chan says good-bye to "Mr. Dawson," Dawson informs the detective that he is now Sir Dawson. As Dawson leaves, Chan notes to Barry, "Excellent recipe just discovered - one pinch of aristocracy added to small mind makes fat head." British Museum Official: "I didn't realize that you were an Egyptologist, Mr. Chan." Charlie Chan: "Compliment most flattering, but incorrect. Am merely unworthy student." 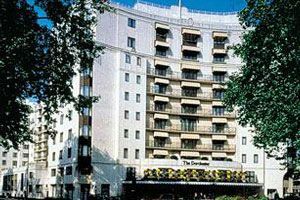 The Dorchester - The Dorchester is a five-star luxury hotel that is located in London's Mayfair and overlooks Hyde Park. It opened in 1931 and during World War II, it was considered one of London's safest buildings due to its strong concrete construction. Over the decades, many famous personalities have stayed at the Dorchester, including Charlie Chan and son, Barry! Wellington School for Boys - Wellington School is located in the small town of Wellington which is about 140 miles west of London. 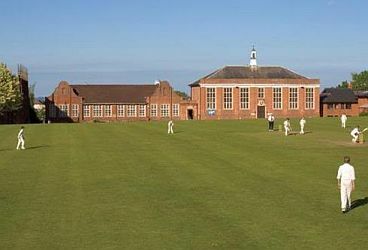 The school first came into existence on its present site in 1837, as a private boys school. Girls were accepted in 1972. Stimulation of brain by intriguing problem is much more interesting than banker’s draft. Enthusiasm of youth always gratifying. Any personal sacrifice for sake of one's belief is most worthy. Only kings can abdicate by choice. Excellent recipe just discovered – one pinch or aristocracy added to small mind makes fat head.